Henery Hawk is a cartoon character from the American Looney Tunes and Merrie Melodies series, who appeared in thirteen cartoons. His first appearance was The Squawkin' Hawk, directed by Chuck Jones and produced by Leon Schlesinger. Henery's second appearance was Walky Talky Hawky which also featured Foghorn Leghorn and The Barnyard Dawg, directed by Robert McKimson. The last Warner Brothers short to feature Henery was Strangled Eggs. He appeared most recently on The Looney Tunes Show. In a typical Foghorn/Henery cartoon, Henery strikes out on his own for the first time, eager to capture (and presumably consume) a chicken. Having led a sheltered life, however, he does not know what a chicken looks like, only that chicken hawks eat them. Foghorn presumes that this diminutive, naïve troublemaker is no real threat; however, seeing the potential for annoyance, he points and manipulates Henery in the direction of Barnyard Dawg. The remainder of the cartoon is usually consumed by Dawg and Leghorn alternately assuring Henery that the other is a chicken and encouraging him to attack the "chicken" mercilessly. In a reversal, the cartoon The Foghorn Leghorn has Foghorn wanting Henery to believe Foghorn is a chicken, where Henery believes Foghorn is merely a "loud-mouthed shnook," supposedly a separate kind of creature. Later, when Barnyard Dawg calls Foghorn a "good-for-nothing chicken", Henery finally wises up. Many cartoons ended with Henery capturing one (or both) of his tormentors, pragmatically shrugging his shoulders over whether his prey may or may not be an actual fowl. Typically, Henery would decide that one of them must be a real chicken; therefore, he would knock out and capture both, after threatening them with the catch-phrase "Are you comin' quietly, or do I have to muss ya up!?" 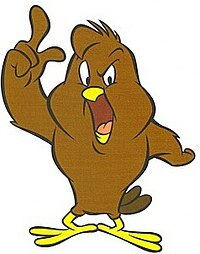 Henery Hawk is also a supporting character in the Looney Tunes comic books; in pre-1970s stories, he often starred in features of his own, typically played against Oliver Owl as well as Foghorn. Henery Hawk made a brief cameo appearance in the bleacher scenes of the 1996 film, Space Jam. In the 2010s series The Looney Tunes Show, Henery Hawk first appeared in the episode "Fish and Visitors", in the Merrie Melodies segment "Chickenhawk" (sung by Barnyard Dawg) where he tries to eat Foghorn Leghorn while Foghorn tries to break him of his craving. In "Father Figure," Porky Pig becomes the father figure of Henery Hawk who wants Porky to get him chicken. In 2011, Henery Hawk appeared in a commercial for GEICO along with Foghorn Leghorn. In the commercial, Foghorn was serving as a reader for a "book on tape" version of the Charles Dickens novel A Tale of Two Cities when Henery—sick and tired of Foghorn's ad-libbing—takes a club and hits Foghorn with it off-camera. ^ Lawson, Tim; Persons, Alisa (2004). The magic behind the voices: a who's who of cartoon voice actors. University Press of Mississippi. ISBN 978-1-57806-696-4. ^ Maltin, Leonard (1987). Of mice and magic: a history of American animated cartoons. New American Library. ISBN 978-0-452-25993-5. ^ Evanier, Mark. "Scrappy Days: The Birth of Scrappy-Doo and What I Had to Do with It". Newsfromme.com. Retrieved 2013-09-02. ^ Mansour, David (2005). From Abba to Zoom: a pop culture encyclopedia of the late 20th century. Andrews McMeel Publishing. p. 212. ISBN 978-0-7407-5118-9. Henery Hawk at Don Markstein's Toonopedia. Archived from the original on January 27, 2016. This page was last edited on 8 April 2019, at 23:15 (UTC).